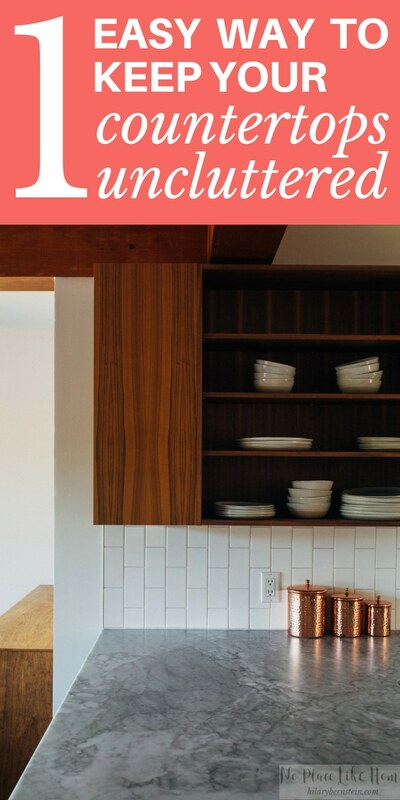 Keep countertops uncluttered with one easy trick! What is it about flat surfaces in a home? They seem to be mess magnets. Papers pile up. Stuff seems to stick. In my kitchen, it can be a trick to prepare food when my countertops are cluttered. Over the years, I’ve found a very easy way to reduce clutter on my counters. But it’s embarrassingly simple. The secret is simply keeping things off of counters. In many homes, this is easier said than done. I do this in my own home by only keeping what’s necessary on my counters. You can use my rule of thumb: If you don’t use it every single day, it gets stored away in a cupboard. In my kitchen, I keep our coffee maker, knives, and cooking utensils on our countertop. Everything else gets tucked away out of sight, either in cupboards or storage spaces. I follow the same technique in my bathroom. I keep as little on the counter as possible (just tissues and Q-Tips), then I store the rest in cupboards. By keeping things off countertops, your counters will naturally look neater and cleaner. What should you do with the rest of your belongings? So what do I do with everything that’s not on my countertops … and won’t fit in my cupboards? When I was single and lived in tiny apartments with virtually no cupboard or storage space, I got creative by buying bookshelves for my kitchen. Instead of displaying books, though, I displayed my plates, bowls and cups. When I was a newlywed and my husband and I squished into a tiny apartment, we used larger shelving units in our spare bedroom to store our seldom-used kitchen things. It was ugly, but it worked. When we moved on to a slightly larger townhouse, we boxed up our kitchen belongings and kept them stacked on shelves in our garage. And now, in our current house, we use a shelving unit in our basement and keep our extra kitchen things there. When it’s time to throw a big party – or if I need a Bundt cake pan or cookie cutters for my favorite sugar cookies – I head to the basement and know where to find everything. The storage in a different room definitely is far from ideal, but when you don’t have much space in your kitchen, it helps eliminate clutter and crammed cupboards. I still have to deal with paper messes – from junk mail to kids’ drawings and schoolwork, but I try to sort it as it enters our home, or during busy seasons I sort it every week. But in general, there’s less stuff on my counters. And that makes less of a mess. I try to sort through everything every couple of days to keep flat surfaces clean. 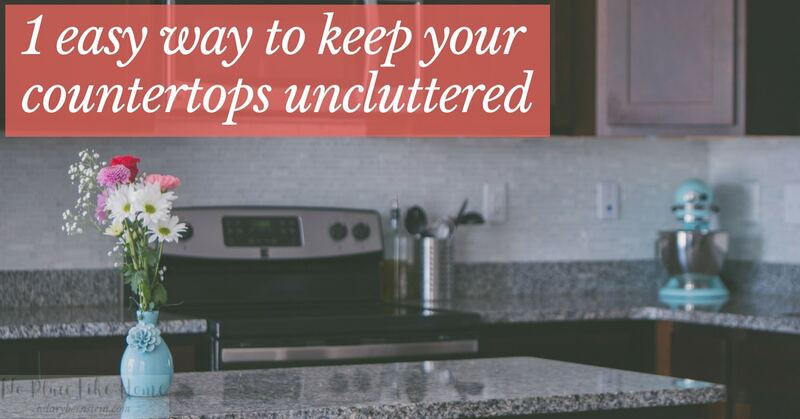 Decluttering countertops is not a difficult process … which is good, because I love quick and easy homemaking solutions! But it’s very doable. 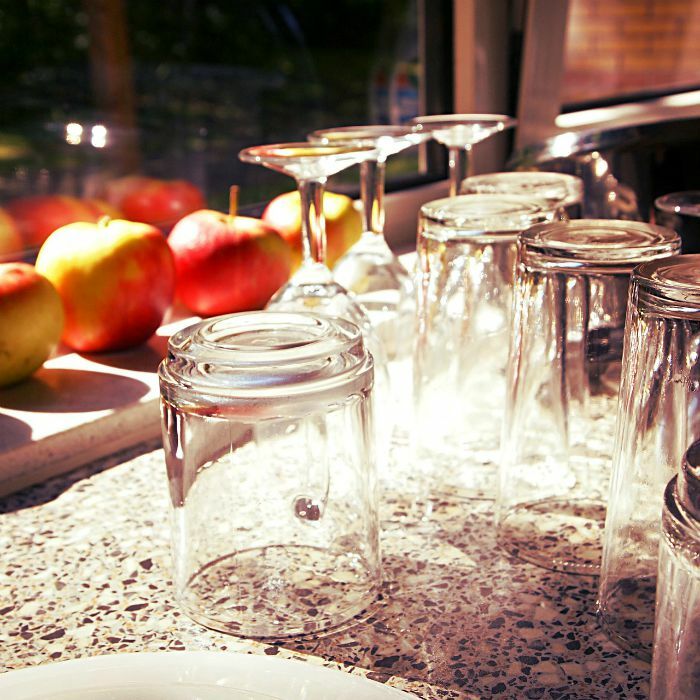 How do you keep your countertops uncluttered? Where do you pile things instead of the counters? Or do you deal with every piece of paper or item immediately? I deal with most papers immediately … when the mail comes every day, I sort it into two piles: keep or recycle. We don’t have many things to keep, so that mail goes to a basket for me to deal with later. I try to take everything else where it belongs … and even if it doesn’t get put away in the right room, it’s in a pile in the right room, so I can go through it later. Great idea, but you don’t say where you keep your things normally on the counter. I have a small kitchen with very VERY few cabinets. One double, two singles on the base unit (plus under the sink for cleaning supplies), and two wide singles, one regular single, and two short doubles over the sink. What do you think of that? I see no hope for me for uncluttered countertops. Sigh. Or is is sob.